Synthetic network and application monitoring is accomplished using agents that run scripts to emulate user behavior. The agents run on workstations placed at multiple locations on an Intranet and/or Internet. The objective of synthetic monitoring is to collect end-user experience information data and provide a mechanism to alert when performance degrades and also keep historical information for trend analysis and decision making. The agents can be either dedicated hardware appliances or software packages installed on existing workstations. For a comparison between these two options, you can read “Hardware Agents or Software Agents for Network Monitoring: That is the Question” In the current blog post, I am focusing on the software agent. The software agent is an attractive choice as long as you have virtual or physical machines available to host the agent software. Then you can easily deploy multiple agents and collect network and application performance data from the network locations that are critical to your infrastructure. Virtual machines are available only at locations such as data centers where you have virtual infrastructure deployed. They are not suitable for deploying an agent at a small, remote branch office. In those locations, the agent needs to be hosted on a dedicated workstation. Although it may sound cost prohibitive to dedicate an entire workstation just to host a monitoring agent, the good news is that today a workstation can be something as low cost as a Raspberry Pi or a Beaglebone single-board computer. With this one step, you can make a workstation an endpoint for synthetic network and application monitoring. Each agent can run periodic Ping, HTTP, Traceroute, DNS, and Iperf tests. You can monitor the network layer performance and routing with Ping and Traceroute, name lookup with DNS, and application response time with HTTP. Iperf can be used to measure bandwidth performance, jitter, and packet loss. 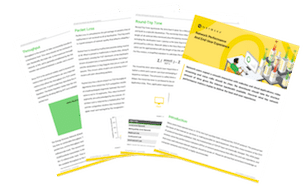 These tests combined with the NetBeez dashboard create a powerful monitoring tool that can be used for proactive network and application monitoring. Each agent monitors performance for applications and resources that are critical for the operations and productivity of the company. 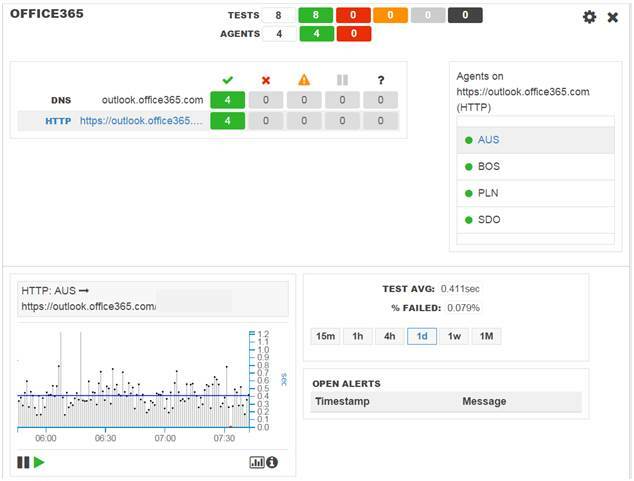 For example, below we see here how Office 365 Outlook is being monitored with HTTP and DNS from Australia, Boston MA, Plano TX, and San Diego CA. With this setup, you can keep get alerts when an application fails or its performance degrades. More importantly, alerting can be done even if an incident happens after hours when there are no users on the network. In other words, the network and application team don’t have to rely on users anymore to report application issues. With distributed synthetic monitoring, the NOC team can be proactive and know which users are affected and where they are located. In conclusion, introducing distributed synthetic monitoring for your infrastructure is as easy as “apt-get install netbeez-agent”. I am sure you have a few available virtual or physical machines you could use for this purpose and get the end user experience on your monitor screen. To learn more about setting up your agents or if you have unanswered questions, consult our Tutorial!